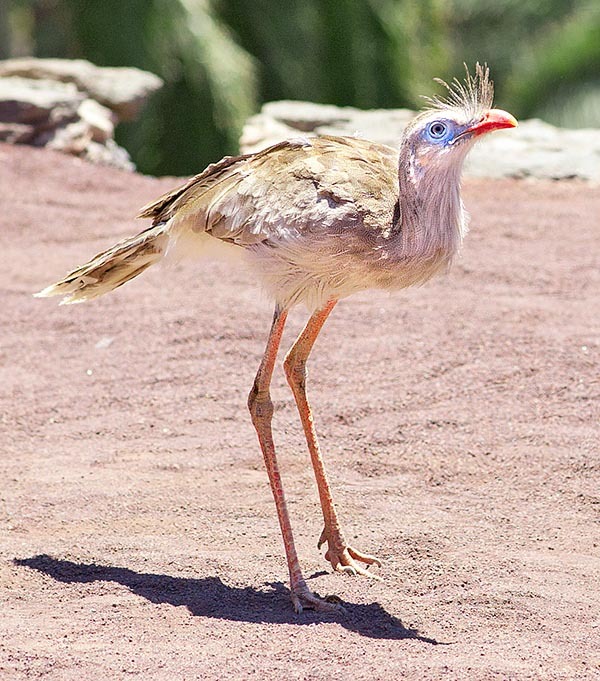 The Red-legged seriema (Cariama cristata Linnaeus 1766) is a peculiar and unique bird in its genus. It is the most common species of the unique two extant species belonging to the order of the Cariamiforms (Cariamiformes) and to the family of the Cariamids (Cariamidae). It is the only living species belonging to the genus Cariama, species: Cariama cristata. 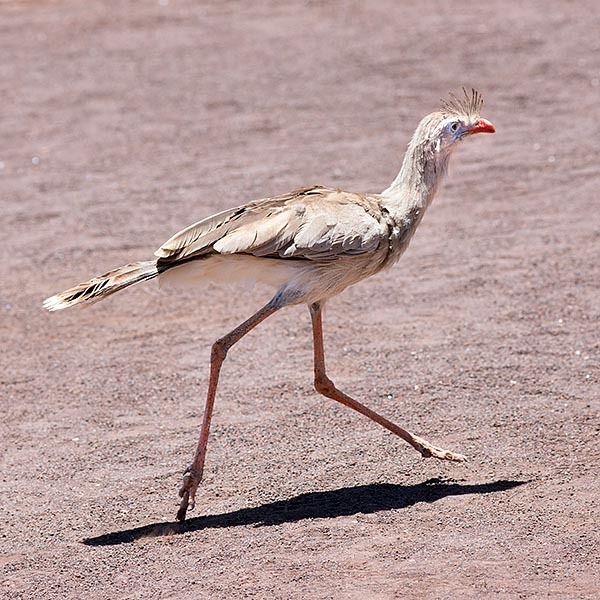 The other species of seriema belongs to the different genus Chunga; it is the Black-legged seriema (Chunga burmeisteri). The term “cariama”, indicating the genus, comes from the name with which this bird is called in its origin place. The term “cristata”, indicating the species, comes from the Latin “cristatus” = “crested” or, talking about helmets, “adorned with a plume”, and here it refers obviously to the characteristic tuft of feathers present on the head. The red-legged seriema is a typical species of South America; its distribution stands inside an ample vertical belt of the continent starting from the prairies of Brazil, south of the Amazon River, and gets to Uruguay and northern Argentina. Presently the species is not endangered even if in Uruguay it is fairly rare and the Argentinean population is declining due to the hunting and the destruction of its natural habitat. The preferred habitats by the seriemas are the open ones: it preferably lives in the prairies, savannahs, semi-desertic zones and dry forests; in any case close to water streams. It lives alone or in par. At times it is seen in small groups of about 4 specimens, in such case these are family groups. In the wild, the seriemas often accompany the grazing cattle in way to find out the insects more easily. These birds often get close to the cultivated fields and the gardens giving the sensation of being opportunistic birds. 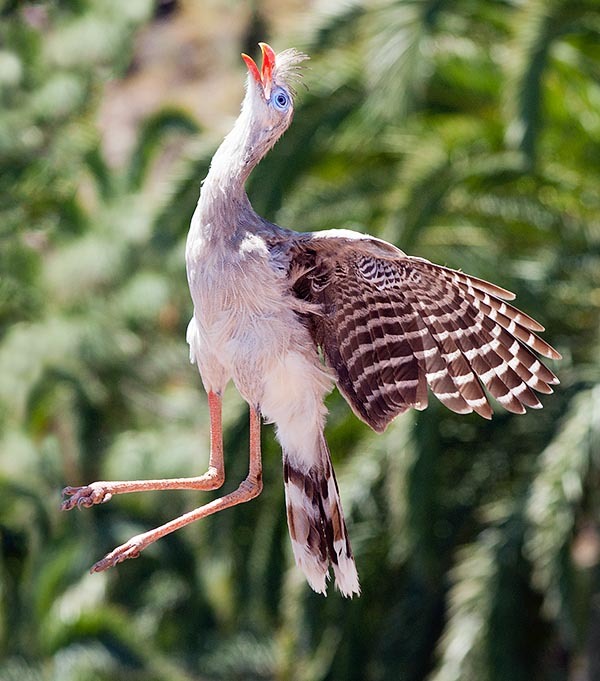 It is nowadays frequent to thee the crested seriema in the rest of the world, outside from its origin continent, in zoological gardens or in private breeding. This bird is about 75-90 cm long and weighs more or less about 1,5 kg. Its shape is characteristic, being conformed as a “running bird”, immediately recognizable thanks to its long neck, long legs and long tail. The livery is brown-grey with fine darker knurling determining a more visible slight streaking when close, on the head and body. The head, the neck and the chest are pale brown with greyish hues. The back, the wings and the tail are more brown-dark brown; the abdomen is whitish-cream. The tail has the two central rectrices of brown colour, whilst the following ones have a wide series of broad bars. The successive colourations of the bars, starting from the proximal part of the feathers is as follows: brown-dark brown (first belt), then white (this white belt is more “contaminated” by brown in the two rectrices lateral to the brown ones and, gradually, less while moving to the rectrices progressively more lateral where it becomes always whiter), black (third belt) and finally again white (tip of the tail). The undertail is, on the contrary, whitish. The portions of the medial barbs in respect to the rachides of the primary and secondary feathers of the wings are barred of white and black (the portions of the distal barbs, smaller, are black), this drawing can be seen only when the bird opens the wings and is more evident in the lower part of the wing where are of the same barred colour also the lower coverts of the wing. The rather robust and hooked bill is of an intense red-orange colour. The legs have the same colour as the bill and are decidedly longer in proportion to the body; they are provided with three fingers, ending in claws, which rest on the ground. A fourth, small, finger is bent backward and does not touch the ground. The eyes, in the adult individuals, have a grey-steel-ice colour. Around the eyes is present a zone of bare skin of pale light blue colour. On the sides of the head, over the eyes, the feathers are paler and draw a sort of a white eyebrow. On the head, close to the dorsal base of the upper rhamphotheca of the beak start some feathers with a rigid look; morbid and erectile, with a dark bar somewhat wider in respect to the rest of the plumage, especially towards the apices of the feathers, which form a sort of crest-tuft on the head and which has determined the name of the species. Many of the anatomic characteristics of this species are shared with the Black-legged seriema (Chunga burmeisteri) which is the only other species living comprised in the same family and which is located in north-western Argentina and in Paraguay; this last species loves more wooded areas and is smaller than the better known and more diffused red-legged seriema. The Cariama cristata is a terrestrial predating bird unique in its kind; despite being able to fly, it hunts on the ground running after the preys. This bird was considered as kindred to the birds belonging to the order of the gruiforms, in which, in the past, was inserted. Its look, for some ways similar to the cranes and the bustards as well as to the birds of prey has created several problems of classification. It has been now inserted in the appropriate separate order of the Caramiforms together with three extinct families. They nourish of insects, snakes, lizards, frogs, birds and rodents integrating the diet, mostly carnivorous, with small quantities of vegetal food. When they catch preys of discreet size (lizards, snakes), the seriemas raise them with the bill and slam them on the ground or against hard surface for killing them. They eat them holding the body of the prey with the legs (utilizing especially the long and extensible claw of the second finger of the leg) and tearing off small pieces with the beak. The modality of killing a prey slamming it on the ground is so much rooted and instinctive that such behaviour can be made to perform, as a demonstration, to trained by men seriemas utilizing rubber snakes and lizards. The members of the pair/family often sing together emitting a cry described as a mix between the bark of a young dog and the cry of a turkey, while singing, they bend their neck and raise the head both moving up and down and keeping the mouth wide open in a characteristic way. Often, as soon as a member of the pair/family ends its own song, another begins prolonging the call; at times the pair sings together strengthening the call. The calls of the seriemas may be heard at kms of distance; some local persons keep some specimens of seriemas in the chicken coops in way to be advised, rightly by the loud cries emitted by these birds, if a possible predator is close to the chicken. If disturbed, it prefers to get away running on foot (up to 25 km/hour) for long distances before taking off. This speces may nest on the sol as well as on bushes or small trees up to 3 metres from the ground; in this last instance they jump into or out the nest rather than reaching it flying. The seriemas build up voluminous nests formed by coarse sticks. They usually spawn 2 whitish eggs little spotted of brown-violet. The female performs most of the incubation which lasts 24-30 days. The pullets, upon their birth, are covered by a down of chocolate colour at the base with long and sparse tufts of a paler colour (brown-beige) which grant the newborns a woolly look. The newborns are semi-precocious and have immediately the eyes open; they stay in the nest for about 2 weeks and then follow both the parents with whom they will form a small, much united, group. They reach the maturity when 4-5 months old. The young are born with brown iris which will become, in a few days time, yellow and will remain as such until reaching the maturity. The juveniles, of the size of the adults, distinguish from these ones due to a greater dark bars in the plumage and the colour of the legs and the mouth which will be, respectively, initially greyish and blackish and then paler orange becoming typically red-orange when adults. From the ecological point of view, this species occupies an ecological niche in South America which, in Africa, is occupied by the African secretary bird (Sagittarius serpentarius), this is a convergent evolution as both species hold some anatomic and behavioural similitudes even if belonging to different orders. It is thought that the seriemas, belonging to the same order of the Cariamiformes (but different family) are the extant closest relatives to a group of extinct South American birds belonging to the family of the Phorusrhacids (Phorusrhacidae) found as fossils in North and South America known under the generic epithet of “terror birds” due to their predatory abilities and for the remarkable dimensions held by some species (up to 3 m tall). The term “phorusrhucidae” means wrinkles bearers referring to the wrinkly surface of the jaw. The biggest species were carnivorous hunters, not flyers, dominant predators in South America at the apex of the food pyramid during the Miocene. The Titanus walleri, one of the largest species, lived from Texas to Florida, then in North America where they had come migrating from South America. In Patagonia they have found the fossil of a species (Kelenken guillermoi) having the greatest skull ever found in a bird; the head was 71 cm long and the beak alone, which had the shape of an enormous hooked bill of a raptor, was 46 cm long. In any case, most of the species belonging to the genus of the “terror birds” were smaller. It is thought that these birds were skilled runners, agile, fast and able to reach a speed of 48 km per hour. The way of running fast, striding, maintaining the head stretched forward and keeping the body arched together with the modalities of remaining in continuous vocal contact of the crested seriemas reminds the velociraptors of Jurassic park and makes particularly evident, thanks to this species, the relationship connecting the modern birds to the extinct dinosaurs. Microdactylus marcgravii É. Geoffroy Saint-Hilaire, 1809; Palamedea cristata Linnaeus, 1766.